How good can surround sound be through a pair of headphones? Stereo is so 20th century. For the best experience in movies and games, you need surround. But it still can be a right pain if you you have a lounge the size of a snooker table, and don't have money to burn. One answer is the Sony MDR-HW700DS. It's a 9.1-surround sound headset plus a breakout box that both provides the system with the necessary processing and makes the whole thing wireless. The one real drawback is the price – at £449 it's even more expensive than the priciest Beats by Dr. Dre set. And they ain't cheap. Let's see if the Sony MDR-HW700DS is worth it. The Sony MDR-HW700DS package comes in two bits. There's the pair of headphones –pretty big but otherwise normal looking –and the control unit. It's a slim black box that plugs into you TV and up to three sources. That gives you enough scope for plugging-in a PS4, a Blu-ray player and Sky box. Or whatever you happen to have. There are also phono and optical inputs for older equipment. Setting the Sony MDR-HW700DS up is dead easy too. Just plug the control box in, hook up the HDMI cables and you're away. The headset is automatically paired, meaning there's none of the fiddling around needed with portable wireless headphones. The headset is extremely comfortable. The pads are huge, using foam padding with the generosity of a billionaire philanthropist. We wore the headphones for hours at a time without a hint of discomfort. They are massive, though –you're not going to want to wear the Sony MDR-HW700DS around town, but you can't anyway. The headphones only work with the control box, as they don't have a secondary input. The headphones also differ from most at-home sets. They use closed backs where many at the price go for the open style, which generally provides better sound quality. The practical benefit is that they block out sound very well and don't leak the sound of your movies and games. If you want to avoid annoying significant others or housemates, the Sony MDR-HW700DS are just the ticket. And when you turn the box off, the AV signal just gets passed through the system meaning you can go back to using a normal speaker system. Perfect. What's important to get out of the way first is that you need to dismiss any visions of headphones packed with loads of little drivers giving you surround sound. The Sony MDR-HW700DS uses psychoacoustic processing instead, which involves fiddling with the sound to alter how we perceive it. In this case, it most likely means playing with the phase of the sound to radically alter how it appears to be positioned around your head. It's complicated, clever stuff that some may turn their noses up. But it is important to remember that the Sony MDR-HW700DS does process genuine multi-channel sound, as well as stereo sources. Much as the final sound is routed through to a pair of 50mm dynamic drivers in the end, the surround effect isn't synthetic all the way through the chain. Just at the point the Sony MDR-HW700DS starts playing with it. You get a bit of control over the effect too. There are Cinema, Game and voice modes, and it's the first two you'll end up using most often –they're the ones designed for use with surround sources, and provide that real surround feel. There are buttons on the Sony MDR-HW700DS control box to let you flick between these modes, but you can actually do just about everything you need to from the headphones. There's a volume dial on the side, along with a mode switcher and an HDMI input switcher. In some ways the Sony MDR-HW700DS can feel like a bit of an experiment, but they're actually remarkably convenient in most respects. The headphones also last a decent 12 hours off a charge. That's good stamina for a wireless set, soundly beating the non-surround Sennheiser RS220's 6-8 hours. As they are charged over microUSB, you can even juice them up with many mobile phone chargers. You can choose to use 2.4GHz or 5GHz wireless bands, and as the actual sound being transmitted to the headset is 'just' stereo, there's no issue transmitting it over standard RF (radio frequency). There's no Wi-Fi or Bluetooth craziness going on here. The headphones are comfortable and surprisingly convenient, but is the Sony MDR-HW700DS package really any good? Yes, as it happens. The clever processing gives the headphones an immense soundstage, getting you an epic sound that you simply don't get with other closed-back headphones. This is a big part of the appeal. It's not just surround imaging, it's the scale of sound that makes you believe it's going on around you rather than in your head. You do get convincing surround as well, though. We compared the Sony MDR-HW700DS to a pair of £500 HiFiMAN stereo planar headphones with great imaging, and you get a much more expansive soundstage here. The set also makes sound that is meant to be coming from behind you seem much further removed. Normal stereo headphones can provide a bit of this 'rear' effect without any fancy processing, but here the effect is far more pronounced, and much clearer. If you want to hear those footsteps behind you in the next Call of Duty game, the MDR-HW700DS will do the trick much better than a regular pair of headphones. The surround effect is coherent too. Badly setup 'genuine' 5.1 systems can come across a bit 'bitty', making it clear that the sound is coming from five or so satellite speakers. Here, the transition between left to right, from back to front, is smooth. It's impressive stuff, and the immersive effect it offers for films and games is simply fantastic. We switched to the Sony MDR-HW700DS from a 5.1 surround system totalling thousands of pounds, and didn't find any downgrade in the quality of the imaging. When compared to a receiver/speaker system of £450, the quality you get here is great. The only downer is that actual sound quality is, predictably, not close to matching high-end headphones that cost anything close to the Sony MDR-HW700DS's £450. At higher volumes the top-end can become a bit harsh and there just isn't the refined detailing in the treble or mids that you get with a truly impressive pair of hi-fi headphones. Sony's psychoacoustic processing also leaves the central channel with a slightly odd and – funnily enough –processed sound that initially takes a bit of getting used to. However, you soon bed in and the Sony MDR-HW700DS has both the bass depth, power and control that's needed to make action scenes in games and films truly impactful. The effects the Sony MDR-HW700DS system can provide are exciting, but if you want headphones that are primarily for music, with a side order of games and movies, you're probably better off with a more conventional pair. For late-night movie binges, though, step on in. Want surround sound without the wires, the leagues of speakers and the threats of eviction that come when you crank up the volume? 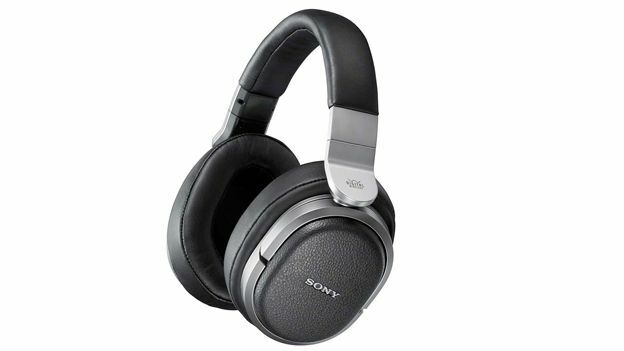 The Sony MDR-HW700DS is the ultimate in gadgety indulgence. It plunges you right into films and games in a way that other headphones don't. The system is expensive, but what it does is rare and effective. Just don't go expecting quite the level of sound quality you'd get from a £400 pair of normal headphones. Sound quality is great, but those looking for true hi-fi should check out a more conventional pair.